It is interesting that we feel as if we know an author because we have read and appreciated many of his or her books. In my case, I have read and enjoyed numerous writings by British author C. S. Lewis, yet I have never fully understood many of his views. Certainly, over years of reading his fantasy fiction and his classic works of Christian apologetics, I noticed his distinct (and puzzling) attitude toward women, but I never really gave his attitudes deep consideration. I was less familiar with his life story, his education, his youth, his marriage, or his worldview. I did not fully appreciate the man, the author, his literature, and his background-until I read the new book by Mary Stewart Van Leeuwen: A Sword between the Sexes? 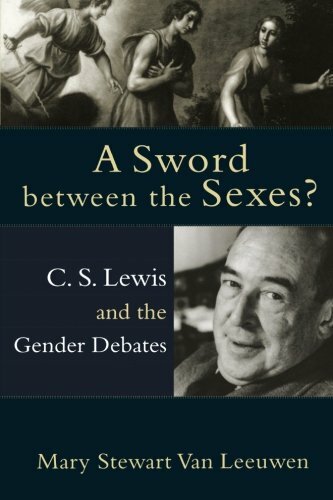 C. S. Lewis and the Gender Debates. Like Van Leeuwen, I had placed the great C. S. Lewis on a literary pedestal, quoting him in lectures, in the classroom, and even in the pulpit. It was a revelation to me that his view of women, as revealed in his books and essays, was so low that some have considered him to be a misogynist, a "woman hater." It may have been unfair to place Lewis in that category, but it was a shock to see fully the other side of C. S. Lewis. Nevertheless, Van Leeuwen does not leave us with a shattered opinion of him. Her intellectual insights unfold a very human and honest picture of the British author, who is still one of the finest thinkers and writers of the twentieth century. In this book, the reader is given a "slide show" of C. S. Lewis's life, interests, philosophies, successes, and failures. We see the scared little boy at boarding school and the tutor in medieval literature at Oxford. We observe the tragic effects of two world wars on England and on Lewis as well as on his public and his private relationships with men and women. As a scholar, Lewis was heavily influenced by his classical, philosophical, and literary interests. These interests, in turn, were heavily swayed by his "Edwardian up-bringing." When Lewis was reared, society maintained a "doctrine of separate spheres for men and women, which were seen as 'natural' and 'biblical"' (39). Further, into his adult life, "he grappled with significant social changes in England regarding both class and gender" (106). Van Leeuwen successfully illustrates that his views on both class and gender did not remain stagnant all of his life. During his earlier years of teaching and writing, Lewis upheld "a hierarchical and essentialist view of class and gender" (247). On the one hand, in his earlier books and essays, we see a Lewis who "wrote as if class and gender were divinely fixed anthropological essences and social categories" (244). His fiction and nonfiction revealed "stereotypical masculinity and femininity portrayed as timeless archetypes ... apparently more significant for the organization of social life than the common humanity of women and men" (42). This is evidenced by the fact that there were no women invited to attend the meetings of the "Inklings," the literary discussion group (which included Lewis and J. R. R. Tolkien) that met in Oxford from 1933 to 1949. He supported the proposal to impose a quota on the number of women admitted to Oxford to study, to eliminate the "appalling danger of our degenerating into a women's university" (37). His earlier writings revealed his Platonic "dualistic mind-set," as Lewis captured good and evil, spiritual and secular, right and wrong, male and female. His distinctly divided worldview no doubt evolved from his deep interest in human reality and imagination and in medieval literature; this is seen clearly in his fantasy fiction. With such a division in mind, the very nature of men and women was fundamentally different for Lewis. It is also clear that, in the 1940s, for Lewis, "there were both 'wifely' and 'motherly' essences laid down by God and nature, regardless of what other roles women might take on as mere human beings" (118). In these writings, he is quick to make assertions about men and women, many of which could not be proven empirically: "men have a more disinterested sense of justice than women; women are more concerned with practical issues than with abstract truths; neither women nor men want women in positions of authority," and so on (159). Even in his Christian writings, Lewis was often tempted to revert back to such Platonic dualistic concepts. On the other hand, Van Leeuwen shows a gradual change in Lewis's views on women. Van Leeuwen employs primary sources, including Lewis's early diaries and private letters, as well as secondary sources such as writings from his students, friends, and colleagues. His later letters and literary writings demonstrate that he was decidedly "less conservative in his private than in his public life" concerning gender issues (245). On the public scene, he believed that "newer" is not always "better," even with respect to gender and the role of women in society. Yet, privately, he wrote letters and essays that revealed a sensitive heart that did not support gender or class hierarchy. Thus, by the 1960s, in the shadow of his own failing health, Lewis wrote A Grief Observed (following the heartbreaking death of his wife) in which he "effectively retracted many of his earlier views on the essence of masculinity and femininity" (29). Perhaps Lewis's views on women began a gradual change because of important women who influenced his life. Van Leeuwen gives us details concerning numerous friendships with women both inside and outside his academic world. He had a reciprocal and respectful relationship with the writer Dorothy L. Sayers, "a woman of his own class and educational background" (107). We are given insight into Lewis's relationships with female students and with young female evacuees during the war. He developed a friendly relationship with Ruth Fitter, who published eighteen volumes of poetry (a feat he was never able to accomplish). It seems that, with his female colleagues, he was "respectful, serious, and (a bit) courtly" (113). Further, Van Leeuwen examines Lewis's views on marriage and childrearing, many of which are surprising, especially in view of his own unhappy childhood. She gives us a telling narrative about Lewis's late-in-life marriage to Joy Davidman, which has twists and surprises of its own. Unlike the popular movie script of Shadowlands (1993), the union of Lewis and Davidman began as a secretive, private civil union and was eventually blessed by the church in spite of the bishop's directive. This committed union challenged conservative beliefs concerning divorce, remarriage, and the realities of human nature. His marriage to Joy seemed to have a "balancing" effect on Lewis; his writings were "less intellectually combative," and he became a more "emotionally accessible" person (201). This concept is not far removed from C. S. Lewis's "better impulses" and very much in keeping with the psychological research and literature on gender issues since his time (170). Indeed, "Lewis was a better man than his theories" (i.e., 240). Certainly, in his later years, in his better moments, and in his private thoughts, Lewis had a more egalitarian understanding of gender differences than what is revealed in his earlier, public, scholarly literature. So, which was the real C. S. Lewis: the public, proclaimed "misogynist," or the kind, concerned mentor to female students, loving husband, godfather, and generous stepfather? Van Leeuwen arrives at a conclusion that was unexpected; it is far better that I allow readers to arrive at this conclusion with Van Leeuwen than for me to spoil the surprise.